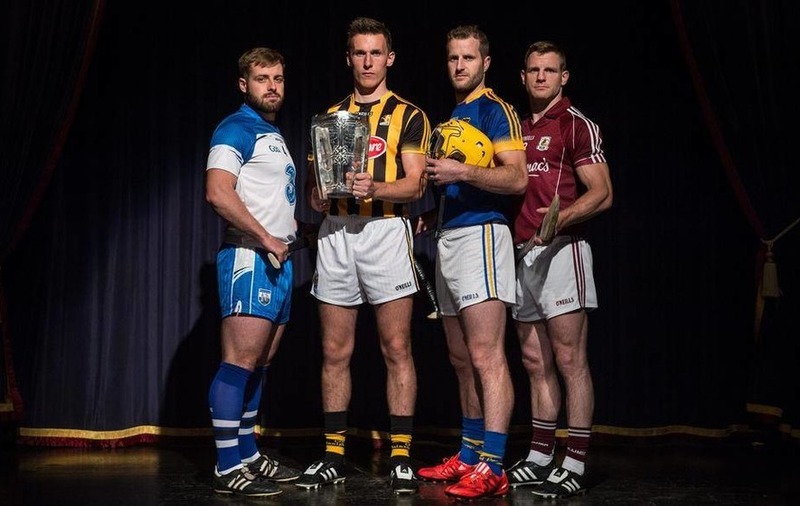 14 July 2015; In attendance at the launch of the GAA Hurling All-Ireland Senior Championship Series 2015, from left, Noel Connors, Waterford, Cillian Buckley, Kilkenny, with the Liam MacCarthy Cup, Kieran Bergin, Tipperary, and Andy Smith, Galway. Langtons House Hotel, Kilkenny. Picture credit: Brendan Moran / SPORTSFILE *** NO REPRODUCTION FEE ***. THE debate about Waterford began in earnest when a photograph taken from the back of the stand at Innovate Wexford Park during a League match in March showed just two Waterford players inside the opposition’s half. Under the heading, ‘Waterford are the new Donegal’, the photo got huge traction on Twitter. After their League quarter-final win against Galway a week later, when Waterford had set up with a similar defensive template and a reporter posed that theory to Derek McGrath afterwards, McGrath said he was “absolutely disgusted” with the comparison to Donegal. “It’s not a totally different game,” he said, “but it’s not blanket defence or anything like it”. Not everyone was buying it. Was this the latest stage of hurling’s evolution? 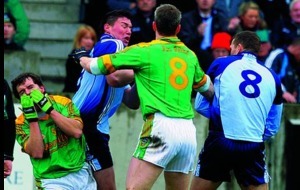 Was this defensive stuff, rampant in football, also going to infect hurling? Smashing conventions is not a new practice but the game has undergone such radical introspection in the last 10 years that innovation now always follows innovation. It makes others think harder. It also forces them to look harder at themselves. Last season, Waterford conceded 22 goals in 10 League and Championship games. When management dropped a host of older and experienced players last autumn, they were doing so with a new system in mind, and the pace, youth and athleticism required to carry it out. To date, Waterford have conceded only three goals from play in 10 League and Championship games. Is Waterford’s system now that radical, that totally new to hurling? Absolutely not. Waterford’s style is broadly similar to the one which almost carried Galway to an All-Ireland title in 2012. Back then, Galway were similarly set up to play counter-attacking hurling. Waterford have been wrongly compared to Donegal but there have been similarities between Derek McGrath’s thinking and the mindset Jim McGuinness adopted in 2011. The first rule is make your team harder to beat. More defensively sound. Then when confidence and momentum builds, as it has for Waterford, the players’ trust in the system is reinforced. As the team evolves, it can become more expressive. Since the turn of the decade, structural set-ups and defensive alignments, along with the massive increase in pace, have been the key changes in hurling, as opposed to the stylistic alterations which defined the game’s accelerated evolution during the previous decade. In 2012, Tipperary manager Eamon O’Shea first spoke about the importance of “a structured randomness”. Hurling is such an instinctive game that nobody can be tied to a set system. The game’s randomness has always been a fundamental part of its appeal but the modern game has been all about reducing that influence. Nobody imagined that the game could ever be played in systems but that is the route it has taken. The game continues to evolve but the tactical canvass has become so wide, and so physically demanding with the increase in contact, that there has been a huge shift in responsibility. Savage workrate is demanded from every player but that requirement extends far beyond tackling, blocking and hooking. Runners must be tracked, space covered, selfless and off-the-ball running is a necessity to try to unlock modern defences. Protecting possession is also a shared responsibility. With extra bodies back, and often only one or two forwards up top, receivers must always move and be available. In that transition to attack, the players playing the pass must give the best ball possible. If the right ball arrives into the vacated space, and runners are coming at the right angles for the offload, all sorts of possibilities open up. In the modern game, though, there is such a premium on tackling and so many bodies in the middle third that more congestion can create tactical headlocks. 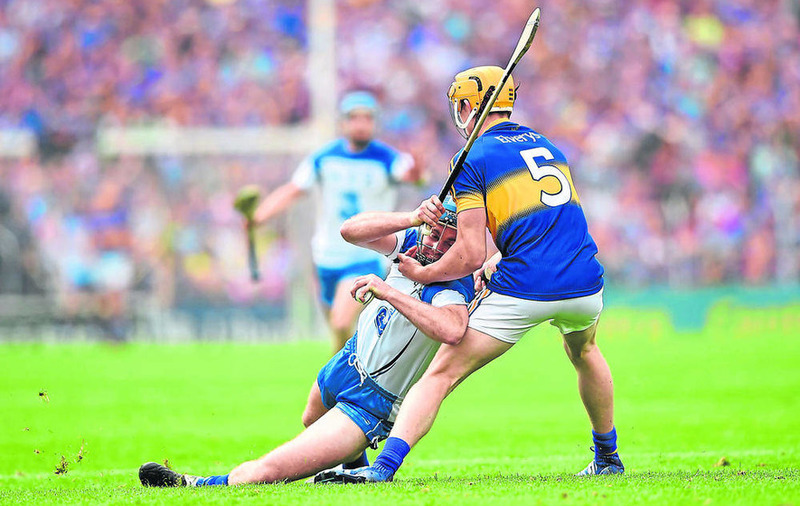 When neither team is willing to give an inch, which what transpired between Clare and Limerick, the tactical war of attrition makes hurling look the antithesis of the game it is supposed to be. 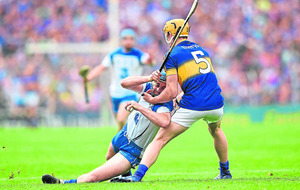 Last weekend, hurling people felt that frustration again. In the three big matches, every single team – Cork, Clare, Limerick, Dublin, Waterford and Tipp – set up with a sweeper. There were just two goals scored in the three matches. In total, there were just 10 decent goalscoring chances created in over 210 minutes. With sweepers, teams were often forced to shoot from distance, which was a contributing factor to the high total of 84 wides in the three games. The same trend was even evident in the Munster minor final on Sunday. When Limerick got an early foothold, Tipp set up with a sweeper. In the senior match afterwards, Tadgh de Burca and Padraic Maher were deployed as sweepers and were on the ball a combined 36 times. De Burca is only 20 but his mastering of the role so early is another endorsement of why Waterford deploy that system. In the first half alone, Seamus Callanan – Tipp’s marquee finisher – only had the ball in his hand twice. Of the eight balls hit into Callanan’s direction in that half, he only won one. Yet Tipp just adapted and had enough classy shooters to be able to work their way around Waterford’s set up. Of Callanan’s 10 plays, he only had the ball in his hand on five occasions. Two of his last three plays were tackles made beyond his own midfield. The best teams now are tactically fluid and adaptable. Some sides pack men behind the ball like football teams. The continuing evolution makes teams harder to beat and delivers results but hurling still must be a game where players always have the freedom to express themselves. They had time and space but the ‘samba’ goal the Wexford U21s scored against Offaly in their Leinster semi-final in June was an expression of how beautiful the beautiful game really can be. Hurling should always have room for that kind of expression but it’s still all about getting the balance right. Like it or not, some structural planning is still often the most logical way to marry expression with results in the modern game.